Many people experience a tight or sore body in the winter. This is most often caused because of reduced activity that makes muscles short and stiff. The dark and cold weather slows us down and sometimes, the temperatures can make us stiff, all of which prevents us from going to the gym. If you want to improve your mood and fend off muscle and joint pain and stiffness, Zumba fitness is the natural prevention and remedy. Zumba fitness workout in Salem, MA is easy to perform and does not require complex training and skills. This workout is also perfect for all ages because the exercise is fun and less strenuous on muscles and joints while still adding the cardio element to exercise. This full-body workout synchronizes dance to dynamic Latin music. As you dance, your muscles and joints get stretched while you shed calories. Since the Zumba workout offers a party-like environment, easily ward off gloomy feelings and catch the contagious energy of other participants. In fact, Zumba fitness class is a great way to increase your energy level, condition your body, boost your mood, and lose weight. If you are interested in more information about this fitness program, contact Salem Fitness Center. When the weather is cold, dark, and gloomy we tend to put off exercise and eat more comfort food. This makes sticking to your fitness resolutions more difficult. It may be challenging with this winter weather but it is still possible to put your fitness resolutions into action. Why grab some friends and try group exercise class together? This will make your workout more fun and exciting. Group exercise class in Salem, MA will help you drive away the gloom of winter and help you get back into shape. You will feel more motivated to workout and push your limits when you workout with friends or make new ones while in a group exercise class. Defy the winter doldrums when by being more active and interacting with people in your class. Also, this group exercise class uses upbeat music to make exercise more fun, enjoyable, and engaging. Although you can workout alone at home, the gym offers a more stimulating and energizing atmosphere. This is the key to staying enthusiastic about your workout despite the temperatures outside. Contact Salem Fitness Center and get started in a group exercise class. There are many benefits to gentle yoga for weight loss being added to a regular work out routine. Although, it burns less calories compared to other type of exercise, it is a great exercise for adding balance, flexibility, and strength. Additionally, it offers a complement of other health benefits that improve quality of life, ability to better accomplish daily tasks, and overall wellness. In addition to the benefits of the yoga poses, gentle yoga class will also teach breathing techniques leading to stress relief. Mindful breathing promotes mental health and helps the body and mind relax. The breathing will also improve your ability to concentrate as you perform meditation. Doing yoga regularly also helps you become more aware of your food choices as you learn to decrease stress which eliminates emotional food cravings. Joining a gentle yoga classes in Salem, MA is also great way to release stress while you exercise. To find out more information about the benefits of gentle yoga, contact Salem Fitness Center. Stress is a predisposing factor to many ailments. In fact, female related hormonal imbalances can often be attributed to stress. A great way to reduce stress and correct hormonal fluctuations in women is to exercise. Boxing training is an ideal workout that can help you quickly lose weight and a great outlet for stress. Boxing exercise drills in Salem, MA allows women to punch and kick as a form of exercise. The footwork and varieties of jabs, kicks, and strikes are a great workout for the heart and the body. However, while you box you can relieve stress and have a blast as you trim down. Physical activity can help relieve tension in the body. It's a great way to calm your mind and release endorphins to improve your mood. Overtime, your hormonal imbalance will be addressed as your body becomes more relaxed. Boxing training in Salem, MA is a fun workout performed with other participants which gives the opportunity to interact and be challenged with friendly competition. Contact Salem Fitness Center to find out more about boxing training workout class. Getting into shape is a popular New Year's Resolution. But with winter weather and dark days, motivation to workout can easily wane. However, when you have a workout group that can motivate you to get to the gym daily, you can stay motivated to exercise. Group exercise classes provide a fun environment for so you won't feel unmotivated and alone in your weight loss journey. When workout in a group you are more energized to do the exercise. You are also often more motivated to take your workout to the next level giving you a greater chance of reaching your fitness goals. Moreover, you can ward off winter blues when you go to the gym to exercise and socialize with other members. You can interact with people that share the same fitness quest as you and you can inspire each other to do your best in your workout. 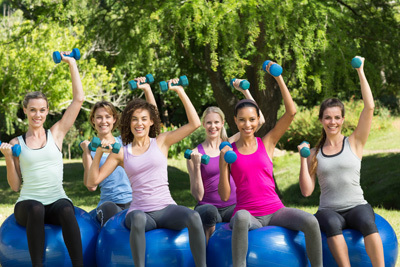 Working out in a group is an effective way to continue to exercise and can be your ticket to faster weight loss. If you have decided to get back into shape this New Year, join group exercise classes in Salem, MA. Contact Salem Fitness Center to find out more. Our warmest Holiday wishes from the entire team here at Salem Fitness. Calendar year 2018 was, and continues to be, a truly remarkable year and we take this moment to recognize the joy that each and every one of you has brought to our personal and professional lives. We exist because of your faith and trust in us. As calendar year 2019 approaches, we reflect upon the foundational recognition that "your success is our success". Our New Year’s wish for 2019 is to nurture our positive and ever strengthening partnership and to deliver ever increasing value to you, your business, and your family through the entirety of 2019. Throughout this Holiday season may you be blessed with health and surrounded by friends and family. All the best! Cheers! The New Year means a fresh start. Make a goal this coming year to attune yourself to a healthier lifestyle. Everything feels better when you have a healthier body and physique. When your body is in shape and fit, you will be more positive in life because you can perform daily tasks better and because you will look and feel better. A women-only fitness club gym encourages women to stay fit so they may confidently face the incoming year. Women-only fitness club motivates women to gradually change their way of living making it better and healthier, resulting in a more fit body. This women-exclusive fitness center covers a large scope of women's fitness needs. Whether women need to improve health and wellness, recover from injury or starting a family, correct posture issues, or just simply lose weight, all these things can be addressed by regular exercise and diet modification. You just need a right place and the right people to guide you reach these goals. Women-only fitness club in Salem, MA is the ideal place to start your fitness journey. We can assist every step of the way so you can achieve your goals faster. Contact Salem Fitness Center and start working out for a better you. The holidays make schedules even more hectic. From holiday shopping, party preparations, and get togethers, people can hardly squeeze in time for their fitness routines. But this is not the right time for anyone to skip their workout sessions, particularly mom's. Our women-only fitness club in Salem, MA encourages women to stay healthy and fit during the holidays. Let's face it, whether at home or at the office, holiday preparations take time and energy. Thus, you can't afford to be unwell or stressed during the season. Women-only fitness clubs can cater to the individual fitness needs of the women who wants to condition their body during the busiest time of year. For those women who want to de-stress from a tight holiday schedule, exercising at the gym can help ease tension. Moreover, this is a great social venue to find community where people can share the same interests and goals. This can help them recover from the crazy holiday schedule and commitments. Give the gift of fitness to your mother, wife or female friend. Contact Salem Fitness Center. One major challenge during the holiday season is resisting the feast. The challenge is even tougher as you spend even more time in the kitchen getting ready for holiday parties and events. When you prepare a holiday banquet, or head to a party or two, adding extra calories is easy. In order to combat these cravings and curb your appetite, join a yoga fitness class. The benefits you get from doing yoga is not limited only to weight loss. It can also discipline the mind and body to become more aware of your dietary intake. Through yoga meditation, the brain is trained to distinguish real hunger from emotional-driven cravings. When you become more mindful of your body's real hunger sensations you can easily restrain yourself from snacking unnecessarily. Yoga Fitness Class in Salem, MA can help you develop full control over your hunger impulses. This way you can easily counter winter weight gain and celebrate the holidays without guilt. Contact Salem Fitness Center to get your yoga fitness training started. One way to make your workout fun and engaging is to do it with friends during group exercise in Salem, MA. Group classes eliminate boredom or the feeling of being alone in your quest to lose weight. Instead, you'll be fired-up with your friends as you together accomplish the goal of exercising each day and as you challenge each other with little friendly competition and encouragement. When you are working out in a group of people with the same fitness goal as you, you are less likely to get bored. Another benefit is that the other members of the class hold you accountable to show up each day. The people beside you will further motivate and challenge you to push harder in each class. You will be inspired to do your best when you see the contagious energy of the other participants. Group exercise classes present members with fun and exhilarating options for exercise that keep them interested and engaged. Additionally, group exercise class is a perfect venue to socialize with people outside of work and to create an exercise support group. When you are surrounded with people with common fitness goals and interests, you continue to exercise. On top of that, socializing while exercising is great for mental wellness as well. Contact Salem Fitness Center to find out more about the benefits of group exercise. Salem Fitness Center $$ 38 Swampscott Road Salem MA 01970 978-745-4007 sfcprospects@gmail.com © 2018. All rights reserved. Web/Marketing Solution Developed and Maintained by WSI Pro Marketing.